Posted on 07 December 2012. Monday morning, December 3, opened a high note on the question that security at the Government Headquarters had somehow been compromised. 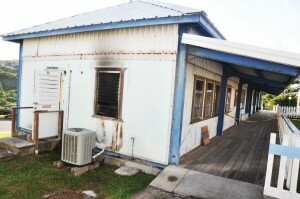 The High Court and Magistrate Court, separate buildings appeared to have been “fire bombed”, according to police who said they have no leads to suspects. We were prevented from seeing the damage to the inside of both buildings, (we later obtained photos from them,) but the Police reported that person or persons unknown up to this time through broken windows, appear to have thrown some kind of accelerant which resulted in fire inside the buildings. They reported the assistance of the Fire and Rescue Service in controlling the fire, and confirmed that a full investigation is underway, following RMPS officers discovery of the fires while on routine patrol early this morning. The High Court, which adjourned at the end of November, is housed in the same building housing the Registrar’s Office and the Magistrates office, separating the Treasury offices by corridors, kitchen and restrooms. The Magistrate Court about fifty yards away is housed in a building adjoining the Inland Revenue Department to the right facing north and with the Ministry of Health to the left also separated by a corridor and restrooms and kitchen. 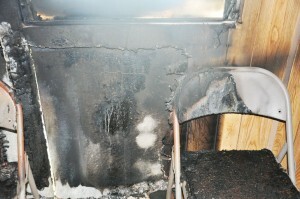 The police said that there is ‘moderate’ damage inside both quarters. As government headquarters workers arrived early to the cordoned off scenes, they were told they would be unable to work as electricity to offices had to be checked and restored. The last time a fire was reported at a court house in Plymouth several decades ago, and like now, arson was suspected, when several court records were destroyed. 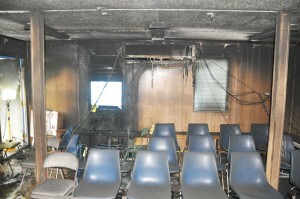 The fire was concentrated on the top floor of the 43-year old building and while there were much damage Clerk of Council’s office records along with brand new equipment, new chairs etc., the Council Chamber and the roof of the building suffered severe damage. 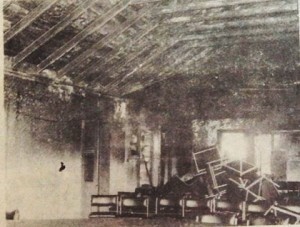 Damage to the offices below was as a result of water. The births, deaths, marriages and land and court and criminal records were very well secured in the fire-proof vault below. 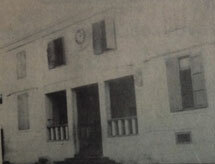 It was police on patrol on the main Parliament Street, who had discovered the fire at the time also. 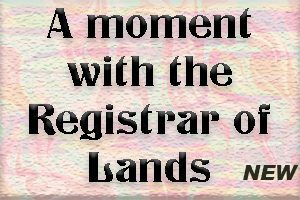 Many people who were on their way home following a Mighty Sparrow show gathered, and included top government officials, such as the Chief Minister, the Magistrate/Registrar and Permanent Secretaries, according to the Montserrat Mirror of May, 1972 newspaper. Early estimates had put the damage at $100,000. Ag. Commissioner of Police Siddell today, Nov 7, told the media in his bi-weekly press conference, while he had no arrests or charges to speak about, complimented his officers for the discovery of the fire, and the national fire service for how they efficiently handled the situation. “…a large number of court records were saved and that fire could’ve been significantly worse,” he said. Siddell responded to questions about the security of government headquarters and private sector properties of significance. He believed that the discussion should proceed, but there was far too much talk and no action. No estimate of the damage has yet been established and there o sound of a motive although speculations are strongly linked to recent court decisions. 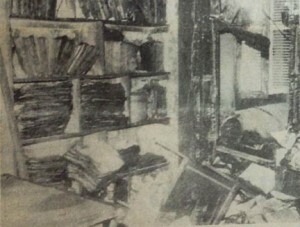 Back in 1972 no arrests were made in connection with that fire but motive was believed to be political.